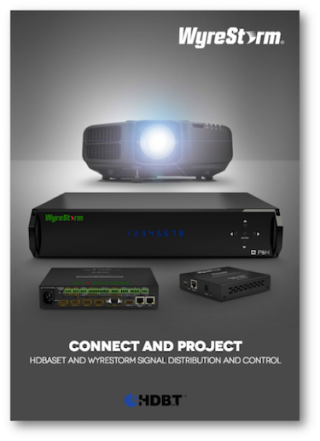 WyreStorm aims to bring the world of direct HDBaseT connectivity into sharper focus with the release of their ‘Connect and Project’ resource that reveals the value in partnering with leading digital projector and AV component manufacturers. Whether HDBaseT Class A, Class B, or the latest HDBaseT 2.0, WyreStorm has emphasized interoperabiity between its products and connected device manufacturers by actively developing partnerships with some of the leading industry brands to highlight the benefits the technology offers component manufacturers, with ‘Connect & Project’ serving as the culmination of those efforts. Part explanation, part proposition, part product resource, Connect & Project seeks to cut through some of the uncertainty that still surrounds HDBaseT to highlight the immense benefits of the technology for manufacurers of devices with HDBaseT inputs. In addition, Connect & Project also offers a wealth of information on how to implement HDBaseT transmission within projects, with the WyreStorm HDBaseT product range divided into easy to digest sections covering 2K and 4K single source or multiple multi-format source integration to HDBaseT-enabled devices, point-to-point HDBaseT transmission, HDBaseT presentation switchers and 2K and 4K matrix switchers. Each section offers application diagrams to illustrate how systems can be created and details on all models within the WyreStorm HDBaseT range, including key features and a product interoperability listing and to help take the guesswork out of product specification. Finally, as active supporters of our HDBaseT-enabled partner manufacturers and the HDBaseT Alliance, Connect & Project includes details of compatible projector brands and a comprehensive listing of currently tested models, as well as HDBaseT wiring guidelines as set out by the Alliance.